this contest is over - congratulations to diana metz , our winner! Congratulations Diana! Your quilt entry has received the most votes. You have won the Sampler Scramble contest. 2nd place was Wendy's quilt and 3rd went to Viola. Thanks to everyone who entered a quilt and to all those who cast a vote! Entrants had until March 1st, 2016 to submit their Sampler Shuffle Quilt photos that are set together with their ORIGINAL setting design. Moda has designed an awesome setting for this bounty of blocks: CLICK HERE to download the MODA SAMPLER SHUFFLE SETTING PATTERN. If you are going to put your sampler blocks together in your own way....CLICK HERE to find out how to be a part of our SAMPLER SCRAMBLE CONTEST - you could win a bundle of Fat Quarters! got SO busy with inventory and a BIG SALE in the quilt shop I didn't get much else done for this blog post - but I will add some more info so.... - I thought I had better get these last 3 blocks up early for you to work on over the rest of the NEW YEAR'S holiday weekend. Wendy came by the shop this week and shared her shuffle blocks. Her fabrics are from the Country Orchard collection by Blackbird Designs for Moda. Thank you for sharing Wendy! Worked on blocks 22, 23 AND 24. Started making Flying geese for the inner border of my shuffle quilts. I am making 2 sets of blocks using different fabrics. For one set I am using Somerset by Fig Tree quilts for Moda and the other set is using Moda Bella Solids and Muslin Mates . 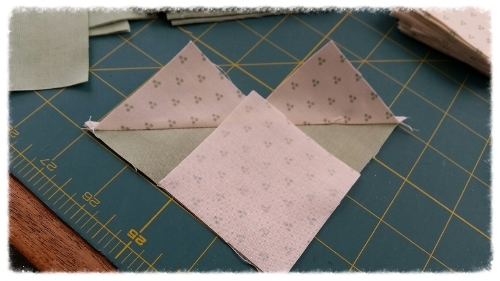 To make my Shuffle blocks into a quilt, I will be using MODA's setting pattern for both of my sets . Have you seen this setting pattern? CLICK HERE to take a look at it. So here we are already 8 weeks along and working on blocks 22 to 24. It is high time I ought to start working on the 144 flying geese I will need for the inner border that MODA's setting pattern uses. Wait ....what? 144? Yes ma'am that's twelve dozen! Egads that's enough to spell the word 'MODA' over and over again. With that many to make I thought I would get going, get organized , do a little chain piecing and have some stacks of geese to show for my effort. Now there are probably a dozen different ways to stitch together a goose . So please use your favorite method. I put together a picture blog slide show to show you what I did to make the geese. This is not something I invented but is one way I have done it when there are a LOT of flying geese units needed. Scroll down to view. 4 goose unit. Square up to 3 1/2" x 6 1/2"
IT HAS BEGUN WITH WEEK ONE! Here are ALL the sampler shuffle patterns . All 30 BLOCKS and the SETTING, BORDER and TRIANGLE tip sheets. YAY! 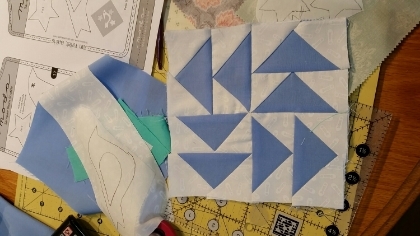 I found that my half square triangles came out slightly over sized - so it is best to square them up to 2" (unfinished) before assembling your block. If you don't , your blocks may have the lovely wonky 'pleated' effect on as I have achieved - see pictures. It's a good thing that they come out oversize and can be squared up - we are working pretty small here with the 6" block size. Going forward I will not be in such a hurry and square things up before I sew the blocks together. Here are the blocks 1, 2 and 3 . I made a second block swapping out the values whenever I wanted to see how it would change. I am really looking forward to seeing next weeks free block patterns now. And.... because I can never get enough time at the sewing machine I am going make a SECOND set of blocks using Bella Solid Junior Jelly Roll or two, some Bella Solids yardage and my background on these block is Moda's white on white with a pattern of itty bitty diaper pins on it. Pretty cute fabric and my plan is that it will turn into an adorable baby sampler. While I'm looking at this picture , I'm already thinking I may need to throw another solid color into the mix. Maybe yellow? I will get started on these first blocks and see how it looks. 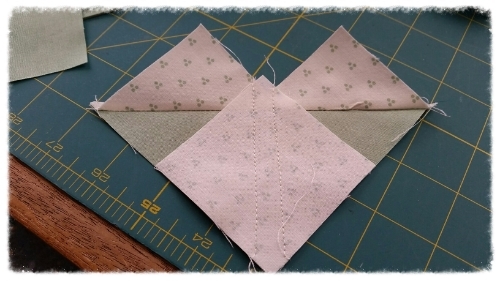 I used my CLEARLY PERFECT ANGLES cling to sew the half square triangles on BLOCK ONE of my Baby Shuffle quilt. I don't have to draw any lines on the fabric squares. Click HERE to visit this product in our shop. Here is a photo from MODA of the SAMPLER SHUFFLE quilt. 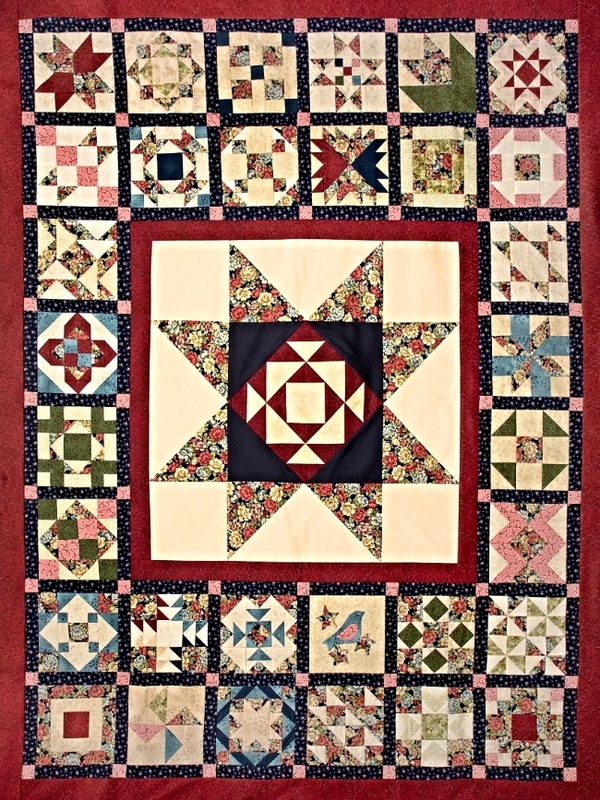 This quilt uses the setting pattern that you can download at the top of this page. Since your pattern is in grayscale I thought you would like to see it in this colorful photo to help you with your fabric choosing . these fabrics are from Mille Couleurs by 3 Sisters and Color Daze by Laundry Basket Quilts - Edyta Sitar. It sure is pretty! Richy Lainson Jr. is sewing along with MODA and all of you! He was so kind to share this picture on Facebook with us. His points are so sharp and perfect - he posted that he uses Marti Michell's templates to get perfect points. Thank you Richy!